Hazem Salah Abu-Ismail would come first if he were not excluded from the presidential race, taking more than 25 percent of the votes, according to an Al-Ahram poll. According to the same poll, the second best presidential candidate for Hazem Abu-Ismail’s supporters was Abul-Fotouh with 25.8%, followed by Amr Moussa with 20.8% and Khairat El-Shater with 20.5%. The second best presidential candidate for Khater El-Shater’s supporters was Abu-Ismail with 54.3% followed by Mohamed Morsi with12.6%, and Abul-Fotouh with 11.6%. The second best presidential candidate for Omar Suleiman supporters according to the poll was Amr Moussa with 35.6% followed by Ahmed Shafiq with 22.2%, Abul-Fotouh with 12.4%, then Hazem Salah Abu Ismail with 12.3%. Considering the decision of the Supreme Presidential Electoral Commission to exclude Abu-Ismail, Suleiman and El-Shater, the Ahram Centre for Political and Strategic Studies surmised that the favourite potential presidential candidate among the sample was Moussa. They calculated that Moussa has support of 40.9%, followed by Abul-Fotouh with 25.2%, Ahmed Shafiq with 10.5%, and Sabbahi with 9.3%. The Muslim Brotherhood’s potential presidential candidate Mohamed Morsi – fielded as a back-up in case El-Shater was not able to run – trailed behind with a low ranking of 0.9%. The poll is conducted on a weekly basis by Al-Ahram Centre for Political and Strategic studies, and its results are published every Sunday. 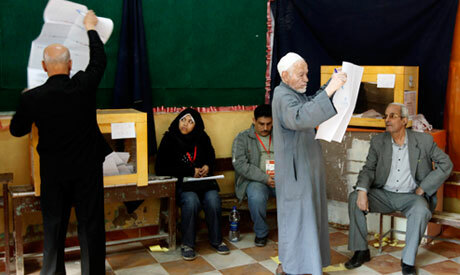 This week's poll was conducted 14-16 April, that is to say before the decision of the Supreme Presidential Electoral Commission’s final decision to exclude potential presidential candidates Hazem Salah Abu-Ismail, Omar Suleiman and Khairat El-Shater after refusing their petitions. The poll takes a representative sample of 1200 citizens from all over the country, excluding the governorates of the Red Sea, New Valley, North and South Sinai and Marsa Matrouh.